Spamalot: a musical lovingly ripped off from the classic film comedy Monty Python And The Holy Grail. 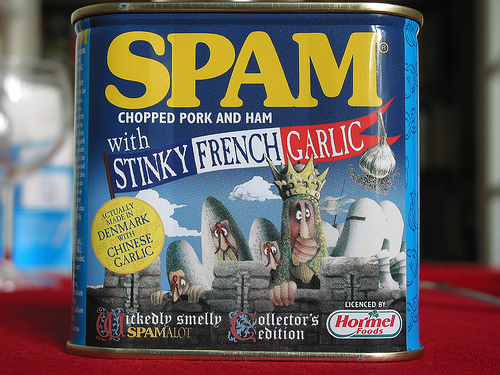 Spam, a lot: a comment about the amount of junk comments received on this blog. Spam, a lot: my daily diet. Fortunately only two of the above definitions are true – Spamalot is a musical comedy and this blog has received several spam comments over the past year. I’m not sure I have ever eaten Spam (the meat product). I did occasionally have pork luncheon meat when I was knee high to a grass hopper, but I’m not sure I ever had the Spam brand. I do, however, own a tin of Spam! There’s a strange comment to make, and I guess it is a Spam comment! But it is true. When Spamalot, the musical, was first announced, I received a promotional tin from the show. I wasn’t sure whether to open it and use it as it was a collector’s item, but as it is not something I usually eat, I decided to just put it in the cupboard. And there it has stayed for the last 5 years! The ‘best before’ date has now been and gone, so I guess it is always going to remain unopened. So, why am I talking about Spam? My initial intent was purely a comment about the junk comments received, but as always, I have allowed myself to be side-tracked! So back to the main point. We all accept that we are going to get junk mail in life, whether that be through the letterbox or in the inbox. It maybe pizza menus, double glazing, wall insulation or sexual organ enhancing! We get emails telling us we have won something and asking us to click the link and send bank details so that the fortune can be credited to our accounts. Whatever it is, for the most part we are sensible enough to just bin it. If it’s the old fashioned paper junk mail, we simply discard it without another thought. If it’s electronic, we may read it first out of interest, and then delete it. That is assuming the latter gets through our junk mail filter in the first place. However, I have to say I was somewhat surprised when my blog started to receive junk comments. Why would anyone want to bombard my humble little blog with junk? It’s not as though it is in the top 50 blog sites – in fact I doubt it would even make the top 50,000! So what is the point of this attack? My blog host, WordPress are very good at all things when it comes to blogging (at least I think so). I have found the software extremely easy to get on with and for the most part, WordPress has always been there providing my blog with a platform from which it can be read. WordPress supplies many a fascinating statistic (if you are into that sort of thing) and have teamed up with what appears to be a very good spam checker – Akismet. Stats show that over 100 spam comments have been trapped by Akismet in the year I have been blogging. In terms of comments, that’s more spam than genuine! Among the many stats WordPress supplies is one which lets me know how many times each post has been read. This is a stat which is not 100% accurate because the current post is on the home page, so it depends how a visitor arrives at my blog as to whether my home page or the actual post registers a count against it. As things stand, my home page has had ten times as many hits as my most read post! Why am I telling you about this particular stat? Well, the spam comments are only held for two weeks before disappearing off the system, so I can only give you a picture of my spam comments from the last two weeks. And in that time I have received 30 spam comments, 29 of which were all attributed to the same post. A post I added to my blog last September, so it has been off the home page for over 26 weeks. With that in mind, the hit count for that post should be at the very least 29 – shouldn’t it? But it’s not, it is only 10. This means that the spammers don’t even go to the post in order to add their comment. This makes it really easy for me to decide whether a comment is truly spam or whether Akismet has misinterpreted it. All I have to do is check my post count – if it hasn’t changed, the comment is definitely spam. And sometimes, the comments themselves tell you they are spam. The following, which was left against the post in question, bears no resemblance to the content of the post. My post was about a long journey I had taken and at no point mentioned cats, pets or animals of any type! This just shows how meaningless the spammers really are. They can’t even be bothered to read the post they are spamming. Are they stupid enough to expect someone who has created a blog is going to be so innocent in the ways of spam that they will click on the link in the comment? What sad little worlds these spammers must live in if they think they are inconveniencing us by trying to catch us out in their little game! Categories: Light Hearted, Musical Theatre, Postaweek2011, Spamalot | Tags: Akismet, Blogging, Light Hearted, Postaweek2011, Spam, Spamalot, WordPress | Permalink.